"You call that ERP? In MY day..."
Houston Neal at Software Advice has put together a nice graphical overview of the events of the past 40ish years in the ERP world. See also a more detailed wiki history, maintained by xTuple's own Wally Tonra. 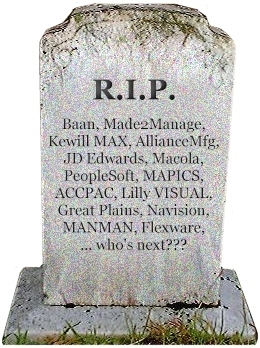 Always interesting to look back, especially to realize (if the tombstones here don't make the case clearly enough) how many giants of the business just simply don't exist any more. Along those lines, a quick note: People often ask if all the graveyard imagery is supposed to mean that the products or companies are really dead, or just sleepy. 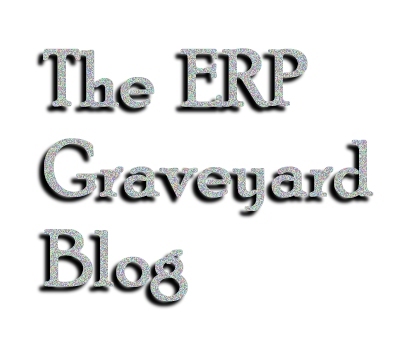 Like soap opera villains, ERP systems never really die - but they can only come back so many times before it gets silly. So it's a fair point to say, "such and such a vendor has thousands of installs and is still selling the product." Maybe so - but if that product/company has been bought and sold a bunch of times, and it's one of many disparate offerings under a single corporate umbrella, the emptor should certainly caveat. So Managing Automation reports that CDC Software, the long-rumored spinoff from the former China Dot Com, is ready to test the public markets. "CDC Corp., through CDC Software International, would wield 98.1% of the voting interests and an 83.4% equity interest in the company after the offering." Dang! Those are what we call in the business, management-friendly terms. I'd be willing to carve off an overvalued chunk of xTuple for something in that neighborhood; please contact me with your sealed bids. Also heard rumors of not so great quarter for them in U.S. but that overall company did ok. With window for IPO's opening up, you would think they would jump through it, unless they cant?!? To which, the collective world of ERP pundits said, huh? Softbrands, holders of the Fourth Shift manufacturing product who pinned their entire future business plan on plugging into SAP (and maybe one day being bought by them), decided to sell out to Infor and its Daddy Warbucks Golden Gate Capital, for $0.90 a share, or about $80 million. Well, $41.2 million anyway - the rest goes to paying off debt and preferred shareholders. It's still a nice premium over the $0.47 closing price last Thursday before the deal was announced, as SoftBrands CEO Randy Tofteland helpfully noted: "This transaction allows SoftBrands stockholders to realize significant value from their investment in our company over recent trading levels." He then continued, "In addition, we increase value to customers through expanded products and services from the alliance with Infor." Yeah, right. Longtime readers of this blog know what that means. SoftBrands has a somewhat complicated history. Fourth Shift Corp was founded in 1984 and was acquired for $40m in cash in 2001 by AremisSoft, a public company that had already bought some hospitality software vendors. AremisSoft started to crumble amid class-action lawsuits and allegations of fraud later that year. SoftBrands came into being at the end of 2001 as a wholly owned AremisSoft subsidiary housing the manufacturing and hospitality products. AremisSoft filed for Chapter 11 bankruptcy protection in March 2002 and SoftBrands emerged as an independent entity after the reorganization. It raised $20m in external funding before going public in 2005. SoftBrands also made a number of purchases including Medallion, Infra Business Solutions and Hotel Information Systems. The one thing everyone seems to agree on is that Fourth Shift's special arrangement with SAP is unlikely to survive the new Infor owners. Seeing as how they stopped selling the non-SAP flavor Fourth Shift completely some time ago, it's hard to see how Infor is going to do anything with the Fourth Shift product but dig a hole and throw it in. Tofteland already dug the hole a long time ago for FS and put it on life support a couple of years ago. Jim and his team will have no difficulty in pushing FS over the edge and covering it with earth. You must give credit Tofteland for his ability to milk the customers over the last few years, revising his salary when he made no bonus and repricing his options. He will laugh all the way to the bank - that CROOK! Clearly they bought Softbrands for the hospitality software. Fourth Shift was down to 600 customers in September of 2007 (per a Fourth Shift employee in a position to know) so they probably don't have more than 500 at this point. Those Fourth Shift customers don't know a milking from a hole in the ground.... YET... But they are going to find out now that they are in the clutches of Infor's infamous, ominous "Audit Team". A word to the wise: Read your contracts up, down, and sideways, because if you step one inch out of line, they are going to threaten, draw blood, whatever it takes to get as much $$ outta you as possible.. Oh, and by the way, if you are thinking about looking for another ERP product, do it QUIETLY, and get it implemented before even uttering a word to your Infor rep.. Thats when they ger REALLY ugly. Welcome to INFOR! 09/10 - Infor will announce in the next few days that they are no longer offering the FS Edition of SAP Business One to new customers. Question - What about the existing customers? There were big layoffs yesterday. About a third of the manufacturing workforce. - No new customers for the FourthShift/SAP Business One product. what, Craig Conway wasn't available? So, Thomas Kelly is out as Epicor CEO, after a less-than-successful standoff with a determined acquirer. And like Peoplesoft founder Dave Duffield, former Epicor boss George Klaus has stepped back in as president, CEO, chairman, and whatever else. Will he be able to push through a sale with dignity? EPIC hasn't improved much since bottoming out at $3 after the November post below. Man, that $9.50 offer from October must be sounding pretty good. Apparently with EPIC stock hovering around $3, the private equity group hovering over the battered company has decided that its offer of $7.50, down from $9.50, might be a little rich. Managing Automation reports that with the broader markets in the toilet, Elliott was able to pull out thanks to an "out" in their offer tied to any of the major indices going losing 10%. As anyone who's had the courage to open their 401(k) statements lately knows, that hasn't been a problem. Disclosure: I am the CEO of a competitor to Epicor, whose open source ERP solution is doing quite well. you blog died. 3 months and no post. weak. your spell grammer bad. weaker. But thanks for letting me know that my Jan 21 post was eaten by Blogger. Fixed.